As we are nearing the mid-point of our second semester I am excited to update you on the positive activities that are happening on campus! 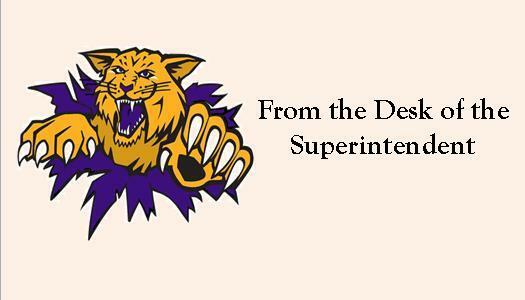 Our Wildcat Team of faculty and staff continue to amaze me with their compassion for their students and loyalty to the district in the hard work they put forward every day to make sure each student graduates ready to take on their next chapter in life. As you all know, January hit all of us with very cold temperatures that caused us to have several late starts for our student’s safety. Along with that, the flu bug also took its toll causing us a day out because of low attendance from both students and staff. Through it all, we have continued to have a successful, busy year, with many different activities taking place. Most recently, the 37th Annual Wildcat Classic took place which gave our fans a great week of basketball from area high schools! Upgrade heating and cooling for the entire district, which will include the gym. Energy efficient LED interior lighting. Repair chimney and sandstone to prevent additional water damage to the auditorium. I would like to Thank the many “Partners in Education” for their continued support of our school through their monetary gifts, services, time, and knowledge. I genuinely feel that the strong collaboration between our students, parents, faculty, staff and community continues to make our school district a strong foundation for our young people. Basketball season is coming to an end and soon we will be at the ballpark watching baseball, at the links for golf or on the track cheering them on. Our Fine Art programs have also been enjoying a productive year with several vocal and instrumental concerts. I’m very happy to say our drama department has been revitalized and is actively rehearsing for their performance later this month; “You’re Making a Scene” will debut Friday, Feb. 23 at 6:30 and Saturday, Feb. 24 for a 3:00 matinee. The department is also hosting a spaghetti dinner prior to their Friday night performance. Dinner prices are $5 in advance or $7 at the door beginning at 5:00 p.m. and performance prices are $3 in advance or $5 at the door. Please come out and enjoy the production in our school auditorium! The vocational departments of Business and Ag are working on their competition seasons also. Business students have qualified teams in Entrepreneurship, Marketing, Digital Video Production, and Hospitality Management for districts along with the individual contests later this month. The Ag department is gearing up to begin their contests and look forward to sending several teams to their district as well. I encourage and welcome you to come to campus and share in the great things that our Slater Wildcats are doing! Keep posted on these events through our web page – www.slaterschools.net, on Facebook – Slater Schools or follow us on Twitter - @SlaterSchools.